This isn’t my city | Damian Trasler's Secret Blog - Do Not Read! This is an expression of regret over a sporting event? Really? Coming from the UK, I’m used to seeing footage of riots. I remember Brixton, I remember the Miner’s Strike. I remember the endless procession of soccer hooligans, yelling, fighting, burning and , occasionally, looting too. Vancouver seemed to me to be West Coast personified. All the laid-back attitude of California, with the in-built politeness of Canada. When the USA beat Canada in the early rounds of the Winter Olympics Hockey, the crowds were good natured. I read a blog entry by an American expressing surprise at the Canadian fan who hugged him and said “You wait, man, we’ll be back!”. I don’t think so. I think the game was the excuse, but the people carrying the fireworks, the ones who start to rock the cars, the ones who pick up the fence supports to smash the windows, they were going to do this anyway. Some people came to watch the game, some people came to start trouble. Looking at Twitter and Facebook, the consensus seems to be that, even if you’re wearing a hockey shirt, if you’re part of the riot, then you’re not a fan. You’re an embarrassment. Picture courtesy of Jack FM’s Facebook page. Speaking for my part of Vancouver, I’d like to apologise to everyone in the world. Come and visit when we’ve tidied up, really. It’s normally a great place. This entry was posted in Uncategorized and tagged Bruins, burning police cars, Canucks, rioting, riots, Stanley Cup, Vancouver. Bookmark the permalink. I am sorry. It’s always the few rotten apples that spoil it for the rest of us. I think you’re setting a good example because you’re so courteous about the whole thing. Thanks for invite. I’d love to visit! You’re very welcome. Maybe we can talk Kristen into running a workshop up here? I agree. The people who do this are going to do it for any excuse. They just want to let their rage out, or their inner brat out. They choose to be a bad example for their country, but they don’t look at it like that. 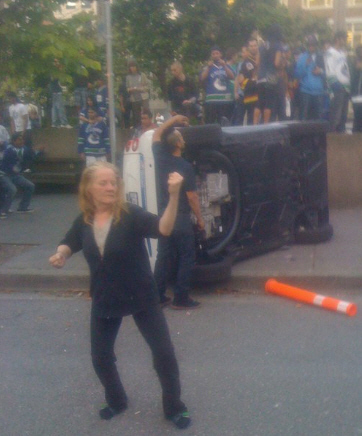 I am sorry this happened in Vancouver, I love it there. And yes, I will come visit. The yd will be about one hour and 30 mins away. So we will make the trip up and visit you, eh? Oh yeah! Come and visit. We built a patio last week, and yesterday I barbequed for the first time this year. Might even have learned how to do it properly by the time you get here…. I heard about this on twitter and in the news….isn’t it sad that sports cause people to act like this? I’m so glad the Mavs won the NBA title; I don’t know what the city of Dallas would have done otherwise. With the win, everyone was happy drunks. It was a real shame, that’s for sure. I hope the city doesn’t let people foget this and things are different next season.